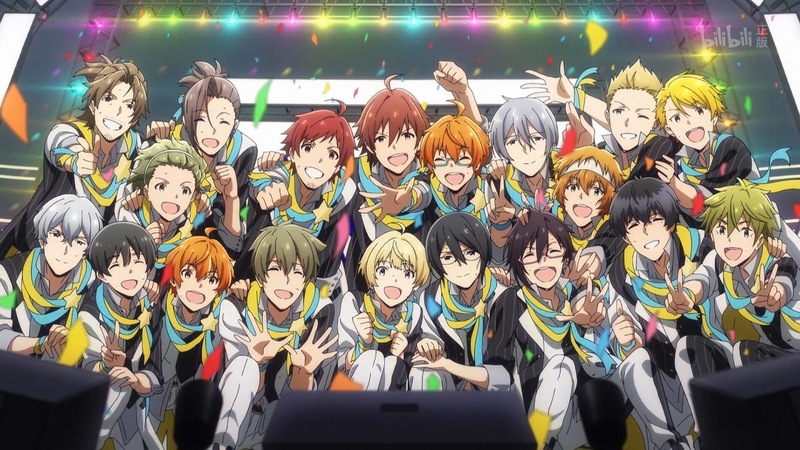 Idol shows continue to dominate the anime time slots on Japanese TV, with more and more of them being devoted to cute boy idols instead of cute girl idols. One of the most prominent of these is the continuation of the Idolm@ster franchise focusing on the boys and men in 315 productions. It may be all the rage right now but this sort of set-up is nothing new. Focusing on male entertainers with a wide cast so that everybody has a type they like has been old news since long before Uta no Prince-sama, and this sort of cast with episodes devoted to lots of different cast members is in the time-honoured tradition of adapting visual novels and otome games. The likes of Love Live! and School Idol Project have devoted fans willing to spend a whole lot on merchandise, so it only stands to reason that the companies making this trash should go after the fujoshi dollar too. Or yen, I should say. And it is trash, but that’s unlikely to be a problem for anyone who enjoys it. Nobody wants to have existential revelations watching idol shows, or be overawed by the original writing or characterisation. They want to see cuteness, familiar safe storytelling and – in probably the biggest departure from most visual novel/otome game adaptations – no romance, thank you very much. Idols are above that sort of thing and strictly forbidden from having relationships. Besides, it’s probably more fun to imagine them getting together with one another than someone from outside the pretty little circle. And all this is very similar, be it girl idols or boy idols. I doubt there’s many people around who, like me, watched both The Idolm@ster and The Idolm@ster: Side M and found them equally enjoyable. In general, though, they’re basically the same thing. In anime it’s often next to impossible to tell a character’s gender without exophoric references, and these androgynous characters are the ones I usually find cutest. So I liked tomboyish Makoto in The Idolm@ster and here, the small and girly male idols like Pierre, Shouta and Jun. The lack of likeable tomboys is probably why I haven’t been able to maintain an interest in Cindarella Girls, though I’ll likely finish it at some point. If there’s a difference in the shows, it’s that in the shows about all-female companies, all of the girls are to some degree cute. Some try to be dark and mysterious or have an ice maiden persona, but they still have cute moments. So everything is generally on a continuous level of sweetness, some characters breaking out into being adorable on occasion. But with the male units, there has to not only be cute but also cool. I mentioned the cute boys, some of them very similar to girls, but then there are the men as well. 315 hires not only young teenagers for its Johnnie’s-like entertainment – two cute but slightly obnoxious former school soccer stars being hired right from the hospital in one episode – but also full-grown men. The anime’s main trio are Dramatic Stars, whose gimmick is that they are former professionals – lawyer, doctor and airline pilot. Another is all former teachers. Honestly, these groups are some of the most unlikeable in the show, full-grown men who are meant to be cool rather than cute, but I just don’t find a goateed lawyer doing twirls to a disco beat to be cool. Thus the problem I had with this show, more than with the previous seasons of The Idolm@ster, was that there were some episodes that focused on characters I liked, which was fun, and then some that were focused on characters I really disliked. Just about all the girls were likeable enough to carry an episode, but 20 minutes of some stuck up former doctor being rude to everyone and demanding to take on more work until, surprise surprise, everyone was right and he collapses of exhaustion … it’s just not characterisation I enjoy. I don’t even know that girls who enjoy the aloof, know-it-all type would enjoy seeing him being such a fool either. When it’s cute, though, the show is definitely cute. And definitely fun. It worked best when the ensemble was together, like when they all went off to stay at a training camp together. That way, nobody gets too tedious. That includes for people who don’t like endlessly bright and optimistic boy-princes with girly voices, of course, and I can totally understand why a lot of viewers would find Pierre annoying as well. Unfortunately, there really aren’t many episodes in this short season that find the balance, and too many episodes just weren’t engaging at all. Because there were only 13 episodes, the anime also cut out a lot of the cast from the game. Several of them got little random cameos, usually passing the main cast on the street and getting a few lines or something like that. For someone like me who doesn’t know the majority of these characters, the moments were very jarring and bizarre. That said, I do wish they’d included fussy violin prodigy Kagura Rei. He looks totally adorable. Technically, the anime is by-the-numbers. Climactic concert scenes have a bit more work put into them, though I’m still not a fan of the interpolation of cel-shaded CG to make animating dances easier, especially as in this show they sometimes have normal animation in the foreground and computer animation behind. The songs are generic and a lot of the guys have kind of annoying nasal singing voices. Animation is on the cheap and stiff side, but character design is nicely varied and fits in with the overall style of the wider franchise very nicely. Just like the original, I’d categorise this one as a guilty pleasure, and when it was cute it was very, very cute. There’s a Pierre figurine I just might buy and regret not pre-ordering before the price went up 50%. But I can’t say I didn’t hope the show would be better, and I certainly think keeping the focus on Jupiter, like in the pilot, rather than on the uninteresting and unlikeable Dramatic Stars, would have made for a much better show.